4th class at Scoil Mhuire, Clondalkin are participating in Maths Week and we are really enjoying the Target Board. We are also doing Mathematical Art, and looking at Escher's tesselations. Great fun this week! All classes at Stokane N.S are examining maths in nature, estimating tree heights, leaf patterns and symmetry. 3rd & 4th Classes at Belgrove Senior Boys School are participating in Maths Week. Our three Third classes are having a guest speaker, doing a maths trail, doing puzzles and our Fourth classes are attending Andrew Jefferey's show in the Helix. Ms Curley, Ms Flynn and Mr Naughton's First year maths classes all taking part in a maths quiz and Ms Flynn's TY group are doing projects on the great mathematicians. Other classes also involved in bingo, card games and brain teaser questions. 4th class class at Scoil Mhuire, Clondalkin are participating in Maths Week and we are relly enjoying the Target Board. We are also doing Mathematical Art, and looking at Escher's tesselations. Great fun this week! Mrs. McDonald's 3rd & 4th Class at St. John of God NS Owning, Piltown, co. Kilkenny are participating in Maths Week through exploring the properties of 2D shapes in our environment and playing online maths games. Mount Sackville maths classes at mount sackville are having a daily maths logic puzzle for each year entered by all students and winners are to be announced on friday 21st. All classes at Eglish NS are participating in Maths Week by playing maths games on the computer and much more. Ms. Naughton's Class class at St. Malachy's MNS are participating in Maths Week by doing a shape trail in our school grounds. Rang 4 at Gaelscoil Aonach Urmhumhan are participating in Maths Week by doing Mangahigh challenges. Ms Mc Caul's First Class at Scoil Chaitríona Junior are participating in Maths Week by playing number games and solving halloween word problems. Naíonáin Bheaga-Rang 6 at GAELSCOIL CHLUAINÍN ag baint an-sult as imeachtaí Mata fud fad na scoile don tseachtain ar fad - Siméadrach, Treodóireacht, Cluichí idirghníomhach ar an Chlár Beo, Comhtháthú le Mata i ngach ábhar curaclaim an tseachtain seo! JC Foundation Maths Class at Ardscoil Mhuire, Ballinasloe are participating in Maths Week and enjoying Maths! Junior Infants class at Coralstown NS are exploring the length of our hair, how far we can throw, jump and the length of snakes!! 5th & 6th Class at Caim N. S. are participating in Maths Week by completing lots of fun maths activities. We're learning without even realising it! senior Infants class at St Catherine's Infant school are participating in Maths Week by playing a series of maths games to help children develop understanding of number in a fun way. 4th Class at Glór na Mara are looking forward to having fun during Maths Week! All pupils in St. Paul's N.S. Castlerea , Co. Roscommon are doing a maths trail a maths challenge involving shape space and measurement. We are also using maths as a living subject by using shop fliers to work out what our shopping bill will be or how much our leisure activities will be. 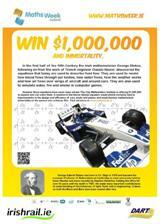 Jesus and Mary College, Our Lady's Grove, Goatstown are Inviting all students to complete the daily maths challenge. Two maths lunch clubs will take place and students can try to find solutions to maths and logic puzzles. 6th Class class at St. Marnock's NS Portmarnock are learning about Maths trails! Room 18 class at Holy Family Boys NS are participating in Maths Week and working hard at the target board activity. We will also be using Manga High to improve our maths. Rang a 4 agus a 5 at Gaelscoil Uí Éigeartaigh, Cóbh, Co. Chorcaí are doing a traffic survey, playing maths games and trying out new websites. Tá an rang ag imirt cluichí agus ag glacadh páirt i gcomórtais ranga. Mrs McGinty's class at Scoil Mhuire are are looking at 3Dshapes and having fun. Miss Falvey's 4th Class at Balscadden N.S., Balbriggan are participating in Maths Week, playing Maths games too! Resource Teacher class at Scoil Iosagain Sexton St.Limerick are Daily maths puzzles,clock tables and interactive puzzles. Fourth Class at St. Patricks B.N.S. are playing online games and having fun with maths. All classes class at Cooneal N.S are planning a whole school project on the theme of Maths all around us. we are making ,maths fun through games and activities and raising awareness of the importance of maths in our everyday lives. Second class class at St. Declan's N.S. Ashbourne are participating in Maths Week.Lots of fun Maths activities planned for the week. TY class at Gallen Community School Ferbane are going to mix PE and maths together in an whole school activity. 3rd, 4th , 5th and 6th Class class at Scoil Phádraig, Garron, Castleshane, Tyholland, Co. Monaghan are exploring maths in our everyday lives and school environment. 6th Class at St. Cynoc's Senior N. S., Ferbane. are participating in maths week, we are studing, discussing and comparing the poll's of the Presidential Election. 2nd years class at Stratford College Rathgar are participating in Maths Week by doing a CSI workshop run by Engineers Ireland and the rest of the school are talking about the history of maths in class as well as fun maths challenges. 2nd class Room 10 class at Mount Sion Primary are doing a Maths Trail and playing Maths games. Junior Infants at St. Catherine's Junior School are are playing memory matching games with the other Junior infant classes in our school. Transition Year at Carrigallen Vocational School are organising a Maths Trivia Quiz, playing Sudoku and learning about the History of Maths. Rang 5 & 6 at Gaelscoil Moshíológ are participating in Maths Week - an outdoor trail with 4th class! Rian Mata le Rang 4 lasmuigh! 3rd - 6th Class at Kilnaleck N.S. are participating in Maths Week. We are using school based maths trails, a puzzle a day and will be playing online interactive maths games all week. A maths quiz will also be held at the end of the week. Fifth Class at Ballinamere N.S., Tullamore are participating in Maths Week by doing Maths trails and competing on Manga High. Ms Devine's 6th class at Beaumont Girls' School, Cork are participating in Maths Week. We are completing challenges and playing Maths games on Manga High. We will also be taking part in a Maths trail around the school. On Friday we will attend a presentation by Dr Maths in Blackrock Castle Observatory. Class 5/6 class at Raheen Wood Steiner NS are presenting Maths challenges to all the classes in the school, and finishing up with a Maths Assembly where the work will be shared and celebrated with everyone! 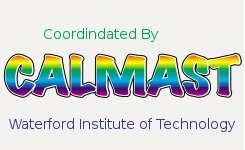 ST.Caimins Community School,Shannon,Co.Clare are participating in Maths Week .There will be daily fun competitionsfor all students e.g. Just a minute Maths Quiz, Maths Trivia Quiz, Maths competitions for Senior and Junior classes, Computer maths competitions, Problem Solving challenges and lots more. 1st Class class at Scoil Carmel are are compleating a maths trail, playing loop games, playing spooky halloween sudoku and having lots of fun with maths games. We can't wait!!! 6th class class at St. Nicholas N.S. are attending a lecture on maths in N.U.I.G. Mrs McWilliam's P3 class class at St Mark's Primary School Twinbrook are participating in Maths Week by taking part in a shoot out challenge aginst P4 pupils. We will be working our mental maths skills to the max!! !We will also be taking part in the online games and having fun with numbers. All classes at Cloonakilla NS are participating in Maths Week by playing on-line games, having a maths day and following maths trails around the school. All classes class at Lisheenkyle n.s. are are conducting an environmental audit when will involve countind,mapping and examining the number of lights,plug-points and energy sources within the school.We will also have a maths trail for each class. Scoil Mológa are Beidh na ranganna ar fad i Scoil Mológa ag glacadh páirte i ngníomhaíochtaí éagsúla ar fad na scoile. Beidh cluichí agus gníomhaíochtaí leagtha amach sa seomra tionóil agus beidh an-spraoi againn ag foghlaim na matamaitice. All classes at Killarney Community College are participating in Maths Week with daily problem of the day, lunch time math trails, number crosswords, who wants to be a mathionnaire, math table quiz,math class of the week competition, mangahigh online games,lunch time computer activities. Sacred Heart Senior School are participating in Maths Week using school based Maths Trails, Maths apps on the Apple iPads, online resources such as Mathletics and Sums for Ireland and also encouraging parents to use online Maths resources at home with their children. Our whole School at Castaheany Educate Together are participating in Maths Week, enjoying maths trails and completing maths challenges! All classes class at St.Mary's N.S Rathowen are We will be working at maths through art, through the use of ICT, playing maths bingo and other maths games. TY class at St Brendan's College are running a puzzle day, learning about famous Mathematicians and attending lecture in the RDS. Mrs Bradley's Class at St. Eunan's National School are playing online interactive maths games all week! Mrs Cullen 4th class class at Réalt na Mara are participating in Maths Week by having a Maths teacher from a secondary school come and deliver a powerpoint/workshop on assessment for learning. This teacher also worked as a Maths consultant in England so are school are really looking forward to it. Colaiste na Toirbhirte, Bandon, Co. Cork are participating in Maths Week along with daily mathematics based fun activities! 5th & 6th class at St. Senan's N.S. are We are doing a maths trail around our school. We have a maths shoot out. Naíonáin-Rang a 6 at Gaelscoil Chill Mhantáin are ag obair ar am, cruthanna, codáin, uillinneacha, sonraí agus réiteach fadhbanna. Cuirfear taispeántas ar siúl agus rachaidh muid ar rian mata. Transition Year at CBS The Green Tralee are Doing a Maths Treasure Hunt in school for Maths Week. Whole school at Castlecomer Community School are having a school-wide Maths quiz on Wednesday of Maths Week. All classes will try to solve 2 puzzles. First 6 correct answers will get cool prizes! All classes at Skerries Educate Together NS are exploring Cubism in Art as part of Maths Week. We are solving and creating mazes and are also working on our code cracking skills. The infant classes are learning ludo and from first class on, we are learning how to play draughts and chess. 1st class at Donore NS are Maths games (dice,cards,dominoes etc). All Class Groupings at Scoil Bhríde Primary School, are undertaking a Maths For Fun Activity each day . On Friday We will have a Maths Puzzles Day for all class groupings in our hall. Transition Year class at Scoil Chriost Ri are participating in Maths Week. Students from 1st to 6th year will join in fun maths activities including maths table quiz, maths trail, maths bingo, maths puzzles, estimating total age of staff, amonog other activities. HAPPY MATHS WEEK!!! Junior Infants-6th Class at Ballapousta National School are The children will be taking part in various activities for Maths week including: creating and taking part in Maths trails, Puzzle afternoons, practical Maths activties and Maths based Art lessons. All classes class at Regina Mundi College are Regina Mundi College will play Countdown, who wants to be a millionaire. The students will be given a daily problem to solve. There will be competitions and puzzles to solve. We will also have Bingo and Maths quizzes. Gaelscoil an Bhradáin Feasa are playing maths games, making "Maths Hats" and going on Maths trails around the school grounds! 2nd Class class at Scoil Carmel J.N.S., Firhouse Road, Firhouse, Dublin 24 are All four 2nd classes in Scoil Carmel Junior National School are participating in Maths Week. Junior Infants class at Scoil Carmel NS, Firhouse are participating in Maths Week!Our morning activity rota is going to be Maths based for the whole week.We are going to incorporate Maths, in particular Early Maths Activities and pattern, into our PE lessons, our Music lessons and even our Science lessons! Elm class at Kylemore college Ballyfermot are participating in Maths Week with fun games and puzzle! Loads of maths competitions will keep both students and staff playing an active part! 2nd Class Maths Recovery; 3rd and 5th Classes Maths Learning Support class at St. Saviour's N.S., Ballybeg, Waterford City. are Playing board and loop games; competing on Manga High; bringing home Maths for Fun games to play with parents, grandparents and siblings. Ms. Mallon's Class at St. Mary's Arva, Co. Cavan are Ms. Mallon's Class will make Maths great fun!We will learn Tables during PE by doing a new game called 'Mathercise'. St Louises Comprehensive College are participating in Maths Week by providing a Carousel of puzzles for year 8 pupils and a number of the day for all classes. The carousel involves 8 puzzles with teams of 4 competing throughout the day trying to solve the problems. Ms McDwyer's 3rd Class at St Paul's SNS, Rathmullen, Drogheda are are participating in Maths Week. 5th Year Maths class at Heywood Community School are attending a guest lecture entitled "Patterns in Mathematics"
All classes at Senior Scoil Mhuire, Blakestown, Dublin 11 are participating in Maths Week doing maths games and investigating maths trails. Coolmine C.S. Clonsilla, Dublin 15 are are having a Maths week poster competition,a Maths quiz for all the first year students, and a daily Maths puzzle competition for senior and junior students. p5 p6 class at St joseph's ballykinlar are participating in Maths Week. A week of mathamatical treasure hunts! First, second and fourth years at Colaiste Choilm are carrying out a number of activities over the week- calulator quiz, suduko, who wants to be a millionaire, games rooms, mazes, orienteering and alot more. The aim is to also try and attend some of the events that are taking place throuhout Cork city. All Classes at Bodyke National School are doing Maths puzzles, trails, games and projects using ICT! Forensics class at Cavan Institute are using trigonometry to conduct blood spatter analysis. Senior Class at Lisnafunchin National School are All pupils are playing on Mangahigh to see who can win most points by the end of Maths Week. jun to 6th class at Scoil Mhuire Lismackin Roscrea Co. Tipperary are having a maths for fun day , assembly singing number songs , playing games . maths trails ,quiz puzzles, and lots of challenges !!!! P1-P7 class at Our Lady's and St. Mochua's PS Derrynoose are are having games, puzzles and quizzes for the children and a Parent Workshop on the 4 operations of number so that parents can help their children at home. 3rd-6th class at St. Mary's, Arva, Co. Cavan are doing a 'Mathsersize' where we will combine PE and Maths to make Maths fun and healthy. We will also partake in other Maths activities. Senior Infants class at Scoil Oilinhéar Naofa Drogheda are Maths games and trails. OLV Boys 2nd-6th class at Our Lady of Victories B.N.S are we aim for every class to attend one of the exciting events on offer. Also every class will get an oppertunity to solve some maths problems in the maths circuits. Maths problems/puzzles will also be posted on the walls to discuss and investigate! Ms Connolly's Class at Our Lady's Meadow Durrow are having a Maths Trail. All Classes at Saint Mary's National School, Ashbourne, Co Meath are Maths Trails, Quizzes, Manga High. All Classes at St Joseph's NS, Longford are participating in Maths Week. We will be holding an all-day 'Tablethon' where different classes will be involved in Mental Maths Activities throughout the day! Room 13 class at Holy Family BNS Askea Carlow are doing math programs such as Math Master in our school's computer room. 5th class at Waterpark National School are going to WIT for Minding your money! Seomra 1 class at Scoil Náisiúnta an Clocháin are designing our own maths trails and filming our own movie about maths around us! Belmayne Educate Together National School are participating in Maths Week by having a maths trail around the school, puzzles of the day for children, parents and teachers and plenty more! For a chance to win one of two Promethean white boards. Register here ».